Well, we are down to the final 2 days before Christmas. I finished stitching my last Christmas gift this week, but it will have to wait for a finish as the hornbooks I ordered have not come in. This is my 2nd Winter Whisper. It is a gift for my Mom. 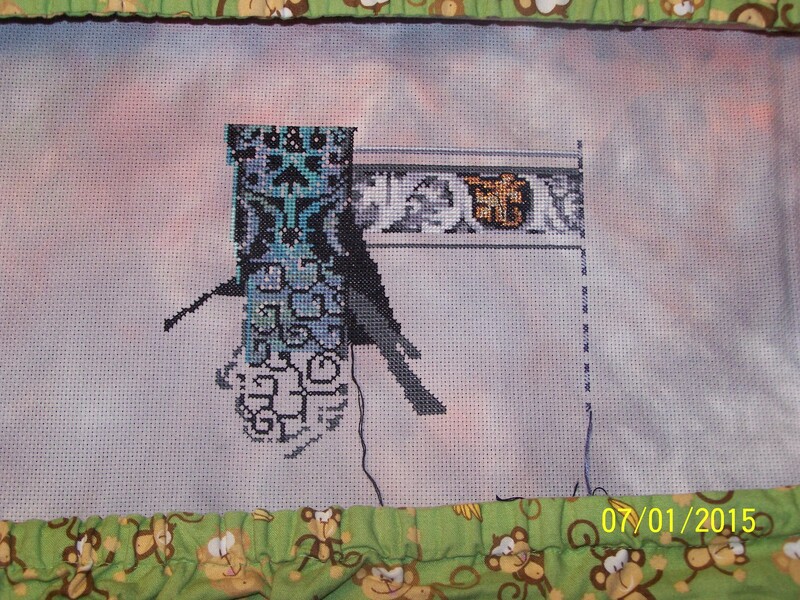 It is stitched on 16ct Aida Ice Goddess by Stephanie. This fabric turned out a little darker, but she still looks beautiful on it. I will turn it into a flat ornament (kind of) and have it all ready to mount onto the hornbook when I get it in. Speaking of Whisper Winter, I wanted to thank everyone who voted for my piece. With all of the votes and the decision of the designer and her assistant, I was awarded 3rd place. I am just thrilled. And here is my wonderful prize package sent all the way from Italy by Laura from Passione Ricamo. I received a beautiful piece of blue 30ct linen. I have never stitched on 30ct, but may give it a try. Some beautiful post cards with Laura’s beautiful artwork on them. A package of 25 skeins of floss and a pattern of my choice. I chose The Night as it has been on my wish list for quite some time. I love all of my goodies. Thank you again to everyone who voted for me. 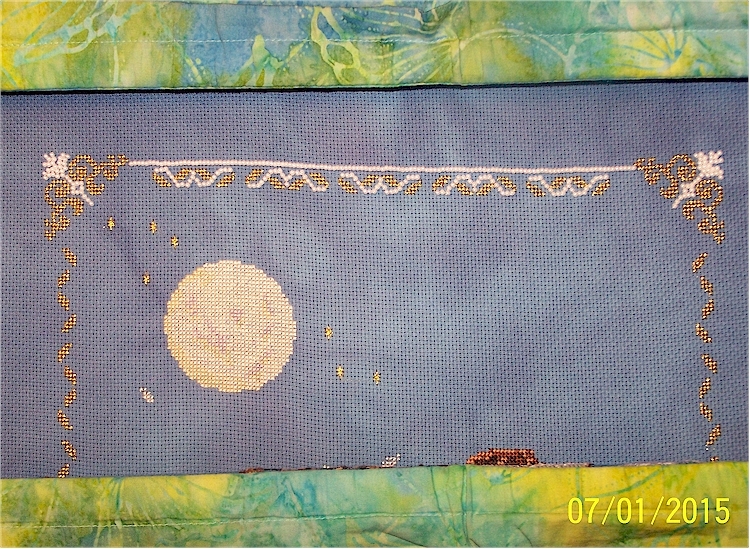 I also finished stitching another piece this month. It is the Raven Queen by Mirabilia. She is stitched on 16ct Aida Twixt N Tween by Stephanie. I LOVE how she turned out on this fabric. Like there is an awesome sunset behind her. A few nights ago I started stitching the train on the Gingerbread Village by Country Cottage Needleworks, but ended up ripping it out last night. I had about half of the middle train car done when I realized that the white stitching really doesn’t show up well on the Lambswool fabric. I was stitching on 16ct Aida, but after talking with my LNS this morning, the Lambswool Linen (which the pattern calls for) is not any darker than the Aida. So I ordered some Dirty Aida for both the Gingerbread Village and the Santa’s Village. I want my white to show up, especially since there is so much. It seems that several of CCN patters are on the Lambswool which doesn’t make any sense to me. Not a good match to me. So I will work on Mirabilia’s Moon Flowers until the end of the year. Cross Stitching, Beading and Crocheting, Oh My! There are going to be a lot of beads on this project! 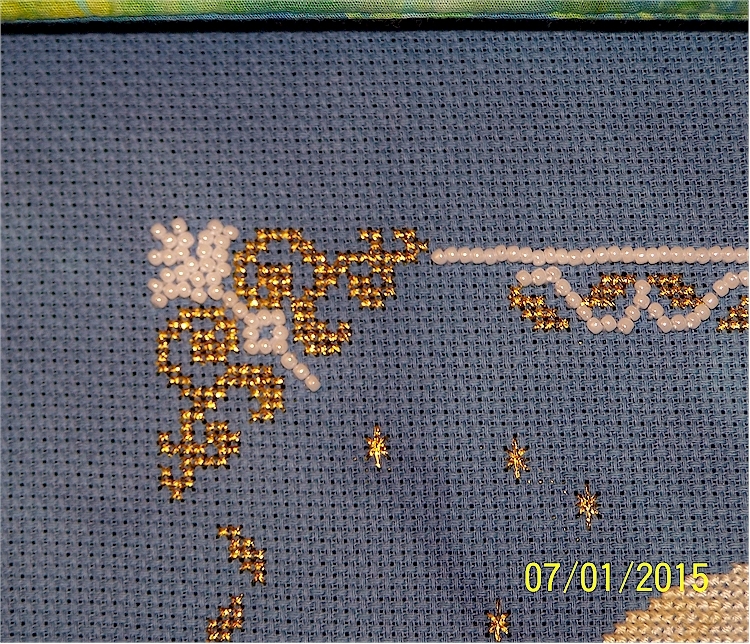 I managed to make them fit along the top border by omitting a few and and then taking my needle through the entire length to try to get them as straight as I could. The corners were easy and look very cool. 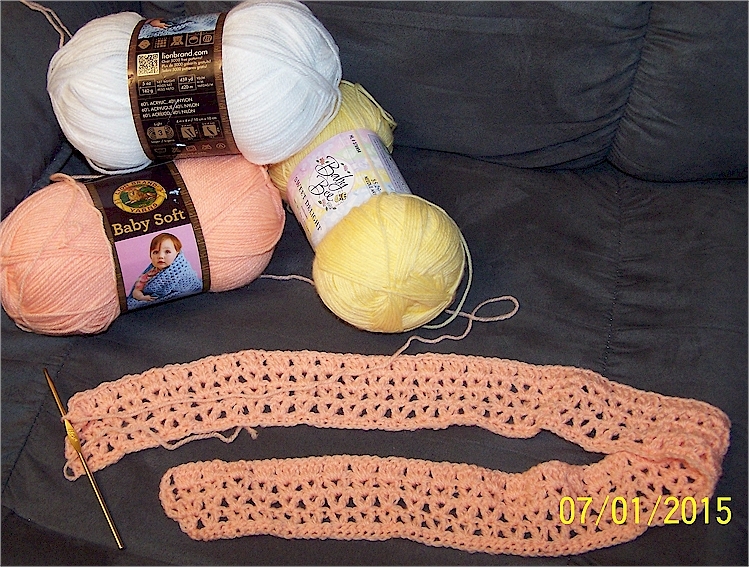 I have been wanting to do a crochet project for quite some time now. After seeing the Citrus Stripe Blanket on Not Your Average Crochet, I knew it was time to get started. My Step-Mom taught me to crochet when I was 12. And I was pretty good at making ripple afghans and over the years, a lot of Bed dolls. But I wanted to get that hook out and do something current and have a “quick, go-to project, that can go anywhere”. The only problem is, I can’t remember a lot of how to connect rows and turning is the biggest problem for me. So, I started with the peach stripe, and decided to sign up for a crochet class. I go next week at a local yarn shop. By then the other colors of yarn that I ordered should be in and I can continue on with this baby blanket. So, that is all of my stitchings for this week. What are you stitching on?